When you’re in a new city, how do you choose a place to dine out? If you have the time, money, and inclination, you could spend weeks, or even months wandering the streets, sampling the food, and developing an encyclopedic knowledge of the local restaurant scene. But what if that isn’t practical? What if you’ve got an important dinner meeting that needs a venue in a hurry, and you can’t afford to make the wrong choice? In that case, you need a shortcut, so you turn to a review site like Yelp or Zagat. Their reviews and star ratings are signals of value, and we rely on them to make critical restaurant decisions. Human psychology is hard-wired to rely on signals—not only with our dining habits, but with every area of life. Should I trust you when you tell me it’s okay to cross the street? Should I take your advice about how to treat a stubborn headache? Answering these questions gets a lot easier if you’re wearing a police officer’s uniform or doctor’s lab coat, respectively. While signals can sometimes be manipulated, by and large they serve us well. After all, wearing a police uniform is a privilege granted only to those who have undergone police training and shoulder the responsibility to serve and protect. And while anyone could secure a doctor’s lab coat, the presumption is that those wearing one went to medical school, paid their dues, and took an oath to do no harm. The restaurant reviews, too, are presumably a reflection of the real qual­ity of the food, service, and dining experience at the establishments in question. 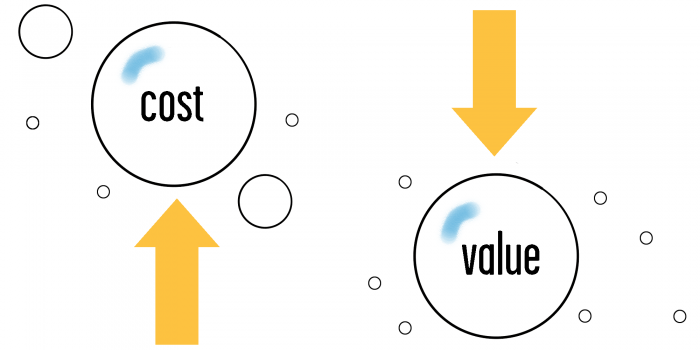 Signals are the shortcuts, heuristics, and rules of thumb that enable us to make good decisions in the multitude of instances where it is impractical or cost-prohibitive to undertake our own thorough inves­tigation of substance. So what does all this have to do with education? Simple: Educa­tion, like the restaurant reviews, police officer’s uniform, and doctor’s lab coat, is a signal. Just because something is a signal, doesn’t mean it has no inherent value. Signals emerge from substance. Restaurants served great food before the reviews said they did, brave men and women vowed to uphold the law before they were recognized with a uniform or badge, and healers toiled to serve the wellness of their communities before they wore white lab coats. The same is true of education and degrees. First there was a need for people who possessed knowledge and skill, and then teachers and institutions set out to provide it. The degree certifying the knowledge of an institution’s graduates came later. Harvard, for exam­ple, took 177 years from its founding to the issuance of its first diploma. Which makes sense; unless the name Harvard is already known and respected, why would anyone care that the university awarded you a diploma? Which begs the question, what does the name “Harvard” signal? Or, for that matter, what is signified by any educational achievement that is respected in the modern world? The answer is plenty, starting with a level of knowledge and skill. If you have a degree in law, medi­cine, or engineering, for example, I probably can trust that you have a working knowledge of that field. And let’s not forget that graduating from a college is a signal that you have what it takes to get into one, which implies a baseline of mental faculties, dedication, and willing­ness to work. But that’s just the beginning. A diploma also signals that you belong to the right club and are a part of the right networks. In addition, you have the financial wherewithal (through personal wealth, connections, or resourcefulness) to afford the experience, which historically has said a thing or two about your background and upbringing. All this conveyed by a single piece of paper. No wonder education has been such a powerful key to the good life, or that so many people wanted it so badly! That desire has kicked the economics of supply and demand into full gear, driving the cost of education up, and up, and up to a place of utter unsustainability. But the real issue isn’t the absurdly high price of education—that’s just an exacerbating factor. The real problem is that the signal’s value has been eroding for some time. Signals can lose their meaning. What happens when a restaurant realizes how important online reviews are to their success? They do whatever it takes to get more and better reviews, of course! Smart restauranteurs will be inspired to improve their food and service, and unscrupulous ones may resort to questionable tactics like asking friends, family, or freelancers on Craigslist to post favorable reviews that bump up their score. And what about the review site whose operators realize how hot the commodity of a favorable review has become? Do they introduce a new service of premium reviews, by which restaurants can pay to have dedicated reviewers dine and post a presumably favorable account of the experience? And if that works, would the cost of this service continue to rise? For a while, this would look like an overheated market, with people doing everything they can to get in on the action. But it’s a recipe for disaster, because the signal that once was backed by substance has turned to smoke. Even worse than ubiquity is a disconnection from substance. To continue the restaurant analogy, imagine a review site based on speed of service, in an era where public desire turns to a slow cooking and dining experience. The reviews may be accurate and meaningful in their context, but they are no longer relevant in the context of their audience. In exactly the same way, the working world of the present and future is simply out of alignment with the substance that education once signified. The working world of the present and future is simply out of alignment with the substance that education once signified. Part of the reason is the lecture format that most colleges still employ, which isn’t an effective structure for most students17. Part is the inertia created by accreditation, which can make it challenging to re-engineer curricula to reflect modern needs. Part is that most course developers and instructors aren’t practitioners, so they don’t even know what modern needs really are. Part is tenure, which allows academics to focus on their passion for particular topics rather than the areas that the market needs most. And a large part is that most university programs were designed either by and for academics, or in the case of MBA-type programs, by and for big business. Neither group is much like the small and mid-market businesses that make up the majority of our economies and job markets. This misalignment with the needs of our graduates as individuals and economy as a whole is especially true with the degrees that you don’t specifically need for any job, but check the box of “requires an undergraduate degree,” no matter how unrelated to the task at hand. These non-vocational degree programs, like liberal arts and even business degrees in the absence of a career track headed for accounting or consulting or investment banking, simply aren’t designed to make their students valuable in the workplace. Using them to accomplish that objective is like using your shoe to hammer in a nail. It might work, but it’s definitely not the best tool for the job. And employers know it. In an annual survey by Express Employment conducted in April of 2017, employers were asked to rank twenty factors they consider when making hiring decisions. Consistent with the results of the past several years, education was ranked dead last18. This might be surprising, until you consider the 2005 adult literacy study by the U.S. Department of Education found that the majority of college graduates couldn’t do things like compare and contrast viewpoints in two newspaper editorials, and 14 percent scored at the basic level of literacy, which is just good enough to read books written for elementary school children19. They might graduate, but they are failing to develop the higher-order cognitive skills that are widely assumed college students should master. Incredibly, even as the value of the education signal has declined, its cost has continued to rise. The ultimate vote of no confidence in the system of traditional education can be seen in the rise of in-house corporate learning centers. General Electric pioneered this approach in the 1950s with its GE University, and today there are nearly five thousand of them.23 That’s five thousand organizations whose core competence is not education, who think that the substance of modern education is so out of alignment with their needs that they would rather do it themselves! Conventional education no longer prepares us for the real world, or offer us the useful skills that we need to be successful. Employers know this, and the signal is quickly eroding. But incredibly, even as the value of the education signal has declined, its cost has continued to rise. The Price of Education: To Infinity, and Beyond? Because most students don’t have that kind of money, they take on debt, and lots of it. As of this writing, seven in ten university students graduate with an average debt of $30,100,26 at an interest rate of 4.7 percent27. Given that it takes about 20 years on average to repay the debt, that raises the real cost of the debt to more than $46,000 and that doesn’t even account for the opportunity cost of going to school and not working full time, which is estimated at another $54,00028. This last part is a crucial factor; whereas American education is notoriously and obscenely over-priced, one might argue that it’s a different story in places like my native Canada (where education is an order of magnitude cheaper), or parts of Europe (where it is completely free). But the hard cost of education is only part of the equation. There’s also the opportunity cost, which is substantial even if you live in a part of the world where higher education doesn’t cost a dime. And high as the price might be today, projections are that college tuition will grow to as high as $130,000 per year by the end of the next decade30. William Bowen, the president of Princeton University, explained that because it’s a people-intensive industry and people have to keep pace with inflation, there are no productivity gains to be had in a university (unlike a manufacturing facility, for example), so we should expect those prices to continue to rise in perpetuity31. These figures are horrendous, but they’re also unfairly optimistic because many of them assume an unrealistically timely graduation. In reality, only 20 percent of students entering a four-year bachelor’s degree program graduate within four years32. Student debt gets wildly out of control as students continue past the four-year range, and many don’t finish at all. While graduation rates at the top fifty schools approach 90 percent, overall graduation rates hover around 55 percent for four-year institutions and 29 percent for two-year colleges33. There are currently 31 million Americans, representing more than 20 percent of the workforce, who have some college credits but no completed degree34. If you feel dumbstruck by this data, you’re not alone. Anyone who is currently mid- or late-career will have “grown up” in a very, very different educational context. Just a few decades ago, the cost of education was a fraction of what it is now, and the benefits were substantial. But in just a few short decades, things have changed almost beyond recognition. Aren’t Degrees Still Table Stakes? Warren Buffett, known as the “Oracle of Omaha” is one of the most successful investors of all time. Famous for his adherence to value investing and personal frugality, he’s grown a net worth of over $80 billion. This is the product of a lifelong investing career that began with his first stock purchase at age 11. To be sure, Buffett had a lot of things going for him in order to get to where he is today: instincts, vision, discipline, and probably a healthy dose of luck. And also one thing that every other investor on the planet has: money to invest. Not that having money automatically makes you a successful investor, but without any money you can’t invest at all. In the same way that money is table stakes for investing, many believe that a university degree has become table stakes for a career. Not that a degree will necessarily get you a good job, but that it’s hard or impossible to get a good job without one. If this is true, then it doesn’t really matter how bad the ROI is on a college education; if you need it, you need it. But do you really need it? Warren Buffet’s story is instructive. It’s true that he needed money to invest, but he didn’t need all that much. His first investment at age 11 was for a grand total of six shares of the oil company Cities Service; three for himself and three for his sister Doris, at the price of $38 a share. Similarly, while there is truth to the “degree as table stakes” argument, it is much more limited in scope than most people think. Remember that signals only ever matter in the absence of better information. If I know you and have experience working with you and have seen that you can do a job well, I won’t care where or if you went to school. It is only in the absence of that familiarity and knowledge that signals really matter. So the question isn’t just one of “does the signal matter”, but also “can I get around the signal?” How easy or difficult it is to do that depends on the size of the organization in question; as a rule of thumb, the bigger the organization the harder it is to find creative ways to connect with a hiring manager and make a good impression. Simply by virtue of the number of people who apply to work at larger companies every day, they put up walls to keep resourceful applicants from bothering their staff, and use applicant tracking system (ATS) technologies to scan the abundance of resumes that they receive. This is a problem for job seekers, but how big of a problem? First, let’s consider how much of the job market this actually reflects. Yes, cumbersome HR processes and ATS technologies are common in big business, but 51 percent of jobs come from small businesses, not big ones35. Given that a quarter of recruiters and talent managers don’t use ATS technology36, that brings the percentage of overall jobs unaffected by these challenges up to over 63 percent. So actually there are a lot of good jobs that lacking a degree doesn’t lock you out of. Degrees aren't the all-access pass to a career that universities like to pretend they are. Most importantly, though, larger organizations are already moving away from the degree as a criteria for employment, as you’ll see in later chapters. While ATS technologies will eventually get better and smarter, the same is true of the companies that use them, which means they’ll be screening for better things than a college degree. In short, no, degrees aren’t the all-access pass to a career that universities like to pretend they are. The cost is exorbitant, the returns are meager, and the entire situation is completely unsustainable. So how much longer can it go on? Education may be the only thing people still believe in in the United States. To question education is really dangerous. It is the absolute taboo. It’s like telling the world there’s no Santa Claus37. Some crashes are sharp, to the tune of a stock index losing a substantial portion of its value in a single day. Others are more gradual—less of a “pop,” and more of a rapidly deflating balloon. The crash of education is likely to follow the latter pattern, and there’s good reason to believe that it’s already underway; during the past five years, higher education enrollment declined more than 6.5 percent38. That might not seem like much, but it’s substantial and a sign of things to come. That raises some difficult and uncomfortable questions: What are the implications for higher education institutions? What happens to the value of the degrees that universities have granted and will continue to grant? By extension, what happens to the holders of those degrees? And if university degrees lose their value, does that mean people won’t go and we’ll end up with an overall uneducated society? Let’s start by acknowledging that the Ivy League and other elite schools aren’t going anywhere. Harvard’s endowment will let them weather any storm. McGill’s alumni network will continue to give its graduates a leg up. Oxford’s industry connections will ensure its graduates get hired. For these schools, learning is actually a secondary concern when it comes to the value of the degree. As such any school will be just fine if it has some combination of a massive endowment that can weather storms, connections with key industry and celebrity professors, an elite brand reputation, and a strong and well-connected alumni network. Community colleges can be expected to survive as well; their cost structure is very different, and they form a strong base for many students. Vocational training will be around for as long as the training does a good job of preparing its graduates to do the work, and that vocation continues to be a worthwhile and prosperous career choice. Some institutions of higher learning will persist as research sites and vocational training for academics. And there will always be a certain amount of demand for overpriced education from people who consume it as an expensive hobby. • A residential, facilities-based approach that drives high fixed costs and requires students to reside away from home and job opportunities. • Parallel development of standard curricula (e.g., Economics 101) by two thousand U.S. colleges and universities. • Parallel delivery of standard curricula live on two thousand campuses. • Relatively equal allocation of key resources (staff and student loans) to degrees in fields of study that are in demand in the economy, and those that are not. Fewer than 10 percent of U.S. bachelor-level graduates are in the highly demanded STEM (science, technology, engineering, and mathematics) fields. • Cross-subsidization among teaching employment skills, liberal arts education, research, scholarship, and operating a vast country club. Essentially, the minority of stuff that people really want and value is subsidizing all the rest. • Focus on the university degree as the credential, versus specific courses and skills accomplished. • Little investment in the career success of graduates. This is not rocket science. University graduates lack basic skills like making presentations, using spreadsheets, business writing, and understanding what it means to be an employee of a business39. Put simply, if an institution charges in the same range as Ivy League institutions but sports unimpressive graduation rates, middling post-graduation employment rates, and low starting salaries for the graduates who manage to find a job, the fact that they’re easy to get into for people who want a college experience will no longer do the trick. This could mean mergers, closures, or both, all of which are already happening in quite a few places, including Marylhurst University in Oregon, Wheelock College in Massachusetts, and St. Gregory’s University in Oklahoma. It also might mean a shift in focus to more adult learners, who are a growing market40. But wait, as wrongheaded as so much of what colleges today might be doing, can’t they just fix it? Isn’t there a scenario where they get their act together and get back on track? Sadly, the answer is probably not, partly because of economic reasons, but largely because current education is woefully out of step with the needs of the modern world in pretty much everything, from the curriculum itself, to the structure through which it is delivered, to the way it is packaged, to the incentives for changing and improving it (or not), to the outcomes that it does (or doesn’t!) deliver. So does that mean college is always, everywhere, and for everyone a bad idea? No, not quite. While most of the reasons given for attending college don’t hold water, there are still some very good reasons to consider it. In the early 1800s, a British aristocrat was craving a flavor he had tasted when stationed in India as Governor of Bengal. So he visited the chemist shop of John Lea and William Perrins, and asked them to prepare it. Lea and Perrins made an extra jar for themselves, but didn’t like the concoction, and stored in the cellar. Some years later they gave it another taste, and found that age had made it delicious. Thus was born Worcestershire Sauce, by Lea and Perrins41. Worcestershire’s strong umami flavor is a great addition to some drinks, marinades, and sauces42, but use with care, because whereas you can almost never go wrong adding salt or lemon juice to a dish, Worcestershire sauce only mixes with very particular flavors. This is a good analogy for a college education — great in certain contexts, but not a good idea for most people. So what are the contexts in which a college degree still makes a ton of sense? In pursuit of a specific vocation. If you want to be a doctor, lawyer, engineer, accountant, architect, nurse, or any other profession that requires specific training and a license, then traditional education is still the path that will get you there. Just make sure the vocation is as interesting to you as you expect it will be (job shadowing is great for this), and that it is as viable a career choice as you think it is (prospects in the legal industry, for example, are looking bleak, as we’ll see in chapter 7). If the college is selective. Of the many thousands of higher education institutions in the United States, only about two hundred of them are selective, meaning that they accept less than 50 percent of the students who apply. Those selective institutions are the ones whose degrees are most valuable, and signal the things that are truly valuable. If you can comfortably afford it. Spending money that you have is very different from spending money that you don’t — both because debt increases the real cost substantially, and because of the repayment burden that it creates. So if you can go to college without taking on debt — either because you or your family have lots of money in the bank, or because you can access scholarships — then the ROI math changes significantly. your worth on every occasion, a signal of “no worse than everyone else” carries more value — as is the sad reality for many women and minorities. This will of course change as the signal continues to erode, but it will probably hold value in this context for at least a few more years. If any (or ideally several) of these criteria are true, college might be a good idea. As table stakes for entering the workforce, or to earn more money in your career. As we’ve seen in this chapter, neither of these goals is well served by a college education, though comparatively speaking, the impact is greater for women and minorities than for white men. To find out what you want to do with your life. College is a very expensive and inefficient way of finding this out, and the volume of topics, ideas, and opportunities that you’ll actually be exposed to is surprisingly limited. Much better is to read widely, engage in some job shadowing, and secure internships or apprenticeships, as we’ll explore in later chapters. To become well-rounded. Taking a handful of electives as part of your degree doesn’t make you well-rounded. At best, it makes you a bit eclectic. More importantly, if the goal is to be well-rounded, then spending a few dozen hours and a few hundred dollars on books or documentaries will take you farther than a much larger investment in college. To learn about things that interest you. If you’re genuinely interested in learning, you’ll best be served by independently going deep on your topic of interest, and learning from the very best instructors in the world through their books and online courses. In most cases, a traditional formal education just doesn’t make sense. That doesn’t mean, though, that we’re headed for a future without education. On the contrary, an education that is well thought out and delivered has never been more important or necessary. In the next chapter, we’ll explore what it will take for education to be relevant in the world that we’re growing into, based on what it will take for us to be relevant in that world. We’ve all been there: snapping out of a daze, we realize that we’ve driven all the way to our destination, but don’t remember any of the journey. Our experience and skill with driving and the specific route make it such that we can do it without any conscious attention. The same is true of other tasks that we’ve been doing for years, like perhaps cooking, gardening… or reading. I’ve definitely had the experience of curling up with a good book, being completely engrossed by the ideas between its covers, and then suddenly realizing that my mind had wandered. Without realizing it, I had gone through several pages, and didn’t have the faintest idea of what they were about. 1. What are some examples of signals, and what are they useful for? 2. 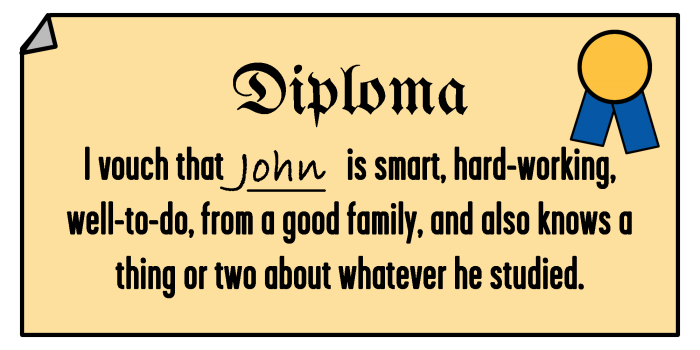 What is signified by a college diploma? 3. Why is the value of that signal not as strong as it used to be? 4. What is the source of “academic inflation”? 5. In the April 2017 survey by Express Employment, employers were asked to rank 20 factors they consider when hiring. Which factor ranked last? 6. In-house corporate learning centers, like GE University, are on the rise. What does tell us? 7. 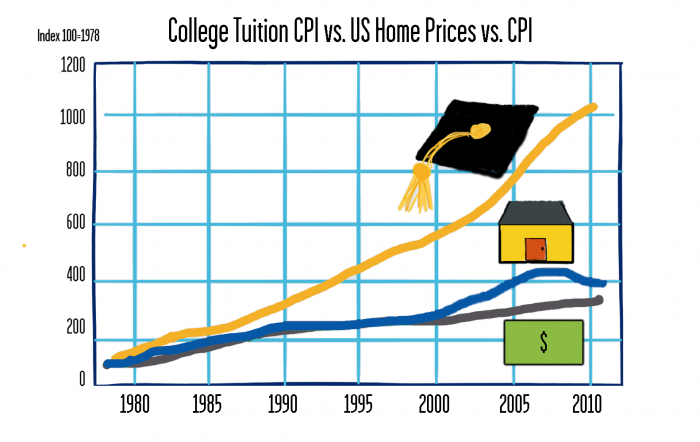 In the last 30 years, how has the growth of college tuition com-pared to inflation? 8. Why is the cost of education most likely to continue rising in perpetuity? 9. What good reasons to we have to believe that education is a bubble? 10. What kind of educational institutions will be most affected when the education bubble bursts? 11. What are some of the characteristics of educational establishments that are ripe for disruption? 12. What are the possible scenarios when the education bubble pops?